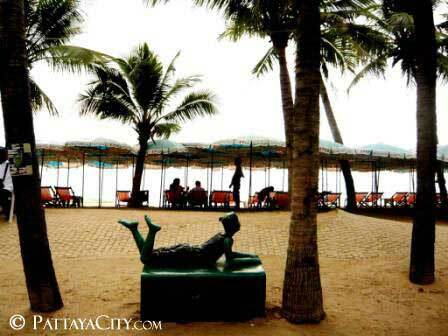 Can you tell me about South Pattaya? Back: Portrait of the Royal Statue of H.M. King Nangklao (King Rama III). Watermark: Portrait of H.M. King Bhumibol Adulyadej & the classical Thai design "Prajumyan". Paper Color: Purple with intaglio and offset printing techniques. Silver hologram foil stripe with the royal Phor Por Ror emblems of H.M. the King and the numbers "500" in Thai, which will be seen in defferent reflecting colors and in various dimensions when viewed at different angles as the note is flipped back and forth. Intaglio latent image "500" that is hidden inside the elaborate design, which becomes visible when the note is viewed from the lower left corner toward the middle part of the note. The Arabic numerals indicating the denomination "500", printed with optically variable intaglio ink (OVI), that change from green into violet when the lower edge of the note is flipped. The Cotton Rose petals, two each on the front and the back, are printed on both sides and registered to make a complete remote floral "Cotton Rose" design when viewing the note against a light source.